Chris Evertsen’s path to becoming a successful online retailer is unique. He is a cycling industry veteran who stepped away from corporate life almost 20 years ago to move to San Diego and pursue a career closer to his passion. 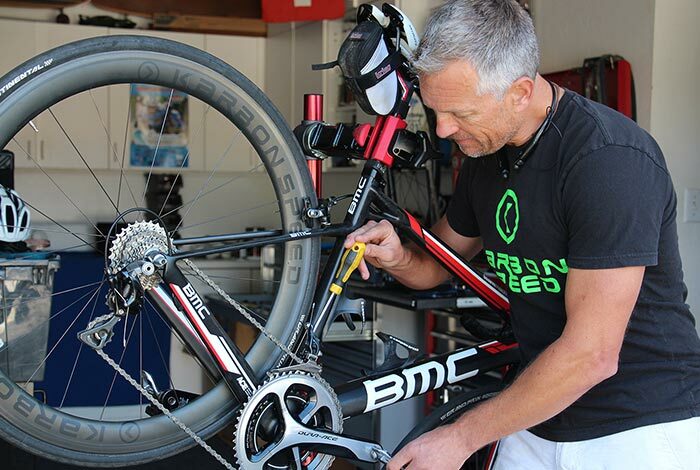 Since moving to San Diego he has had a dynamic career in the cycling industry, working in multiple capacities; both as a shop consultant and owner, professional team manager, and race event coordinator. Incidentally, he has close ties to Swami’s Cycling Club in Encinitas where he volunteers managing and promoting race events (see our June 2015 story on Swami’s Cycling club). Chris began working with Karbon Speed, as a consultant to the prior owners, in 2012. He was hired specifically to streamline the business and improve profitability. Chris had previously operated another online store, using a different e-commerce provider, and was dissatisfied with the technical work required to keep the store running smoothly. When Karbon Speed’s online store launched in 2012 Chris researched the shopping carts available and ultimately recommended Ecwid, primarily because it was easy to operate and required little maintenance to update. By choosing Ecwid Chris was able to easily plug the online store into the existing Karbon Speed website, saving valuable time and avoiding the headache of recreating the entire site. In late 2013, Chris had the opportunity to purchase Karbon Speed from its original owners — then based in Austin, Texas. Chris jumped at the opportunity and moved the store to Encinitas, California. Chris claims that he’s not a big technology guy — he’s a specialist in wheel technology, not internet programming — so he really likes the simplicity of Ecwid. Specifically, Chris likes that Ecwid was easy to implement and has a simple representation. KarbonSpeed.com is built on WordPress, a site builder that works seamlessly with Ecwid. Since assuming ownership of karbonspeed.com Chris has chosen to stay with Ecwid for many reasons: ease of use remains at the top of the list with excellent value, and great support sealing the deal. Karbon Speed’s close proximity to Ecwid’s U.S. Office was the icing on the cake. Karbon Speed is essentially a one-man-show — Chris works with a number of vendors and resources and operates out of a local garage-like setting. He is a natural collaborator, regularly travelling to races and cycling club events, both within the US and around the world, to evangelize Karbon Speed’s technology and generate new partnerships. Chris uses the weather as a guide to target areas to best market to throughout the year (i.e. Florida is a good place to market to during the winter months vs. states in the Northeast; also Australia is huge during these months because it’s their summer), and he enlists Karbon Speed ambassadors everywhere he goes. Chris, an avid cyclist since childhood, is now recognized as a master wheel builder, racer, team manager and event promoter. He is one of Ecwid’s customers building a successful career around a personal passion. 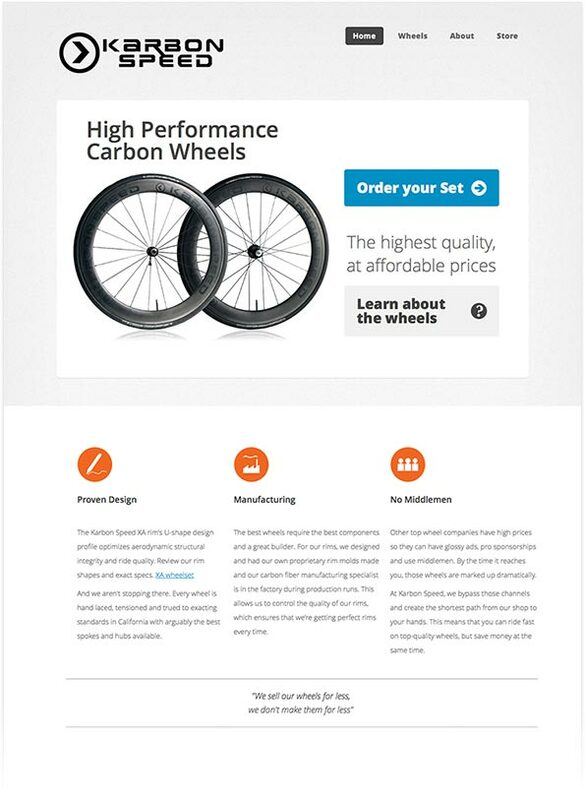 Since Karbon Speed began selling its aerodynamic carbon wheels in 2012 the brand has gained a reputation among triathletes and competitive cyclists as the source for high-quality, yet affordable, aero carbon wheels and gear. One of the keys to ongoing success is branching out into new markets. Karbon Speed is launching a new line of wheels for everyday riders and racers this July.